My African adventure began in the spring of 2007. I was in the midst of a huge life transition. I homeschooled my children from kindergarten through 8th grade. My youngest had just started public high school and I was left with a huge void in my life. My passion for teaching was still alive in my heart, but I needed somewhere to channel it. About this same time I saw a special on T.V about the huge reading famine that exists in Africa. Something in my heart stirred, and even though I could not explain why, I knew I needed to go to Africa.I had heard about Global Volunteers from a friend. I did some research and made my decision. Ghana was my destination. My mission: To teach English to the children, or so I thought. I traveled to the small village of Senchi Ferry in Western Ghana. It was there that I not only had the privilege of teaching the beautiful children of the village, but had the opportunity to meet the most welcoming, kind hearted, spirited community of people I have ever met in my life. My life has forever been changed from my experinces in this village. One day I talked with the children about their dreams for the future. I was surprised to find that in the midst of their underprivileged lives, and the absence of books, they too have dreams of becoming doctors, pilots, scientists and teachers. They have dreams of changing Africa through their education. Education is the key to a different life for them, yet resources are not available. I met Emmanuel, a bright 12 year old who wants to be a doctor, yet has never seen a picture of the human anatomy. Rosina dreams of becoming a pilot, yet she has never seen a map of her own country. It was through listening to the children's dreams that a dream of my own formed in my heart - to build a library for the children of this village. I have just returned from my second trip to the beautiful village of Senchi Ferry, Ghana. This time I brought with me a suitcase filled with children's picture books. I had the amazing experience of introducing picture books to children of all ages for the very first time in their lives. I cannot begin to describe the magic of witnessing the absolute joy and delight that emanated from their faces as colorful pictures helped to tell the stories that were read to them. 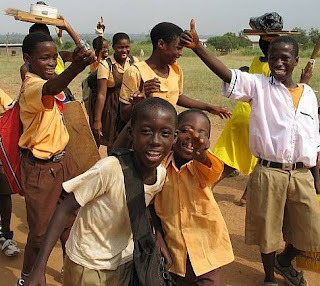 In March, 2007 I traveled with Global Volunteers to do three weeks of volunteer work in a small village in Ghana. The village – Senchi Ferry – is about an hour north of Accra, the capital city. My three weeks there were magical. I was the only volunteer at a primary school, working with children from kindergarten through 6th grade. I taught English lessons in the 5th grade classroom every day, and floated through all of the classrooms singing songs, teaching games such as Simon Says, the Hokey Pokey, and Duck, Duck, Goose, and introducing crayons and colored pencils for drawing (with the supplies that I had brought with me.) The children were bright, healthy, and eager to learn, but there no teaching supplies at the school other than blackboards at the front of every room. I fell in love with the children, the teachers I worked with, and the many villagers I befriended during my three weeks. Leaving was sad. I returned home in early April and not a day went by that I didn’t think about Senchi Ferry. By mid-May I knew I had to return, and I joined another Global Volunteers team to return in October. I decided that when I returned I would bring pencils, pens, crayons and money to purchase a case of paper. I emailed every person on my email list asking for a $1 donation. My plan was to raise $300 to buy the needed supplies. Well, money began to pour in, along with packages of school supplies that friends, clients and professional colleagues donated to my cause. My dining room became a warehouse over the summer as I used the donated $3,700 to purchase every school supply you can think of (except computers.) I wrote grant applications during July seeking in-kind shipping, and DHL came through for me shipping six 50-pound cartons. I carried three additional cartons and a second suitcase stuffed with books and art supplies with my luggage. One last carton was carried as luggage with one of my co-volunteers. In all, approximately $5,000 worth of school supplies was donated to the schools of Senchi Ferry, Ghana. In mid-October I returned to Senchi Ferry with all of the school supplies. Boxes of crayons and watercolor sets were distributed to all the classrooms, along with bags of pencils and pens, rulers, pencil sharpeners, colored markers and highlighters, and six cases of white paper and lined writing paper, posters and maps. My three weeks were filled to overflowing with modeling for the teachers how to teach with all the new supplies, how to manage a library, how to put up posters on the walls, how to use bulletin board border, plus teaching art lessons and reading story books to all of the classes. The supplies were presented during a formal ceremony attended by Education Ministers from the Regional Administrative Offices as well as the Ministry in Accra. Two days later another ceremony awaited me. I was to be installed as a Queen Mother of the village. I didn’t realize the seriousness of this honor until the ceremony began. Drums were sounded, cowbells were banged on and the village was called to the Chiefs’ Palace. I was dressed in traditional ceremonial robes and was lifted upon the shoulders of several men and carried through the Palace Courtyard to the cheers of the villagers. There was lots of African “Pomp and Circumstance” and by the end of the afternoon I was blessed with the new name, Nana Ofeibea II, Queen Mother of Development. Again, my three weeks ended much too soon and before I knew it I was on my way home. I’ve already decided that I will be returning to Senchi Ferry again next October. I feel like my life is now re-energized and with a new focus and passion. I continue to love my work, but know that I have a second life in a small village six thousand miles away.